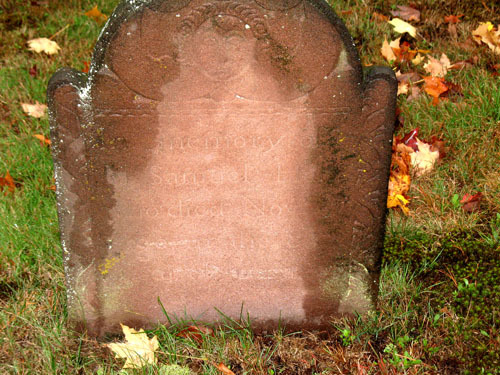 Following are photos of gravestones of our direct Hall family, taken last fall by one of my first cousins who made the trek to the North Cemetery in Somers, Connecticut to document our family. To her we are grateful. 2. 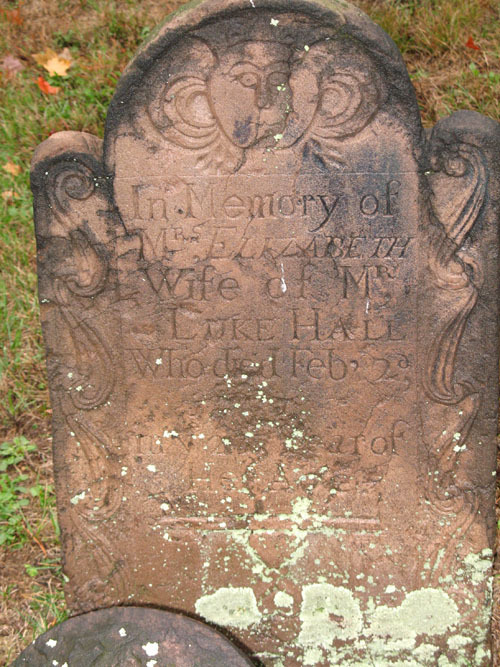 Gravestone of widow Hannah (Parsons) Hall, b 20 Sept. 1719 in Enfield, Hartford, CT; died 14 May 1803; m. Samuel Hall 1 Oct. 1741. 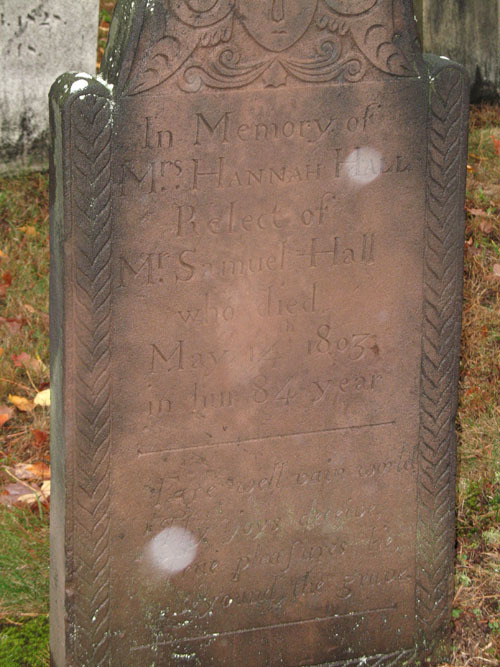 Inscription: In Memory of Mrs. Hannah Hall Relect of Mr. Samuel Hall who died May 14, 1803 in her 84 year. Farewell vain world Thy joys decline…pleasures…beyond the grave. 3. 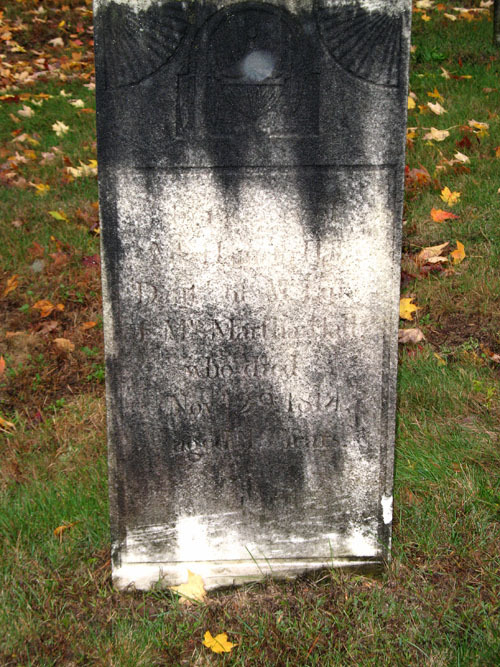 Gravestone of our Commissioned Officer and Patriot of the American Revolution, Lieutenant Luke Hall, b. 4 July 1744 in Somers; d. 19 Sept 1826 in Somers at age 82. Inscription: Lieut. 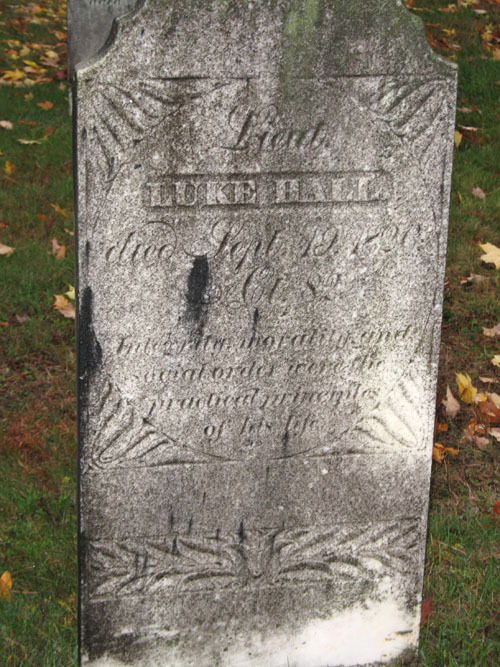 Luke Hall died Sept. 19, 1826,–82, Integrity, morality and social order were the practiced principles of his life. 6. 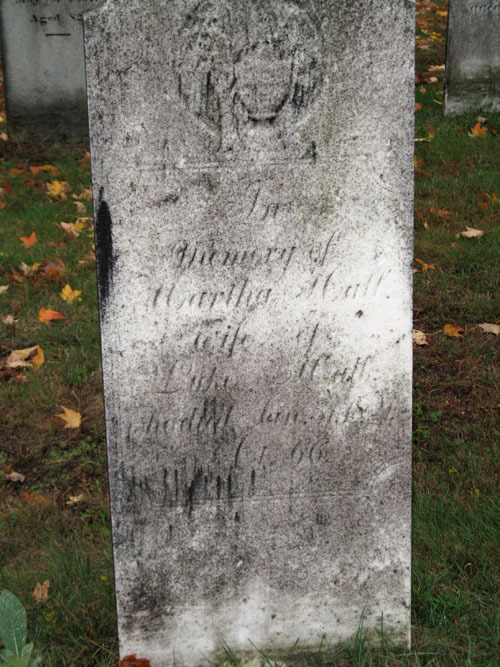 Gravestone of John Hall, son of Luke and Martha Hall. 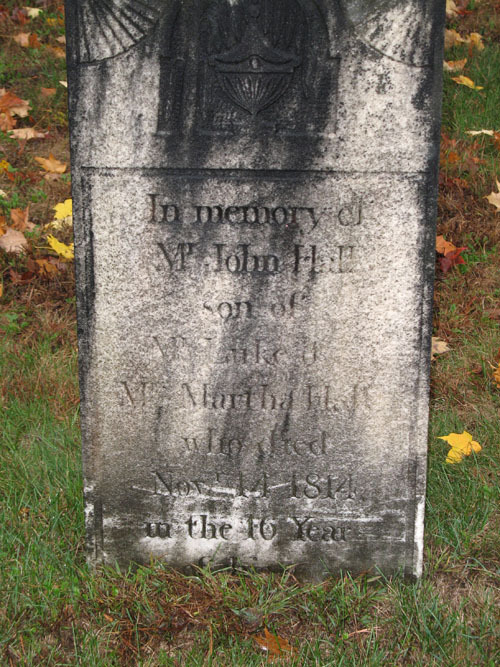 Inscription: In memory of Mr. John Hall son of Mr. Luke and Mrs. Martha Hall who died Nov. 14, 1814 in the 16 year. 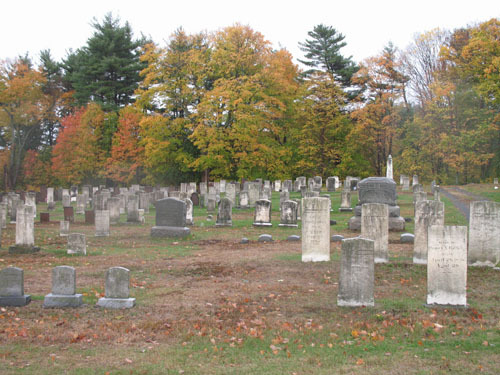 There are many many more Halls buried in Somers North Cemetery. In another post I will include cousins, aunts and uncles. What a lovely way to honour family who came before us, and help keep us connected to them. Thank you, Antonia. Your comment means a lot to me. I am so happy the monuments are still there and that they have been photographed . I had tears running down my cheeks. Thank You ! Oh, Mary, you have no idea how much this comment means to me. Now I am the one with tears, and this sentiment makes all the work all worthwhile. Thank you! Kathryn, thank you so much for all the work you have done researching the descendants of George Hall. Your expertise and attention to detail is amazing. These photos are the crowning touch!